The offer to save on train ticket booking are available on payzapp and airtel money. 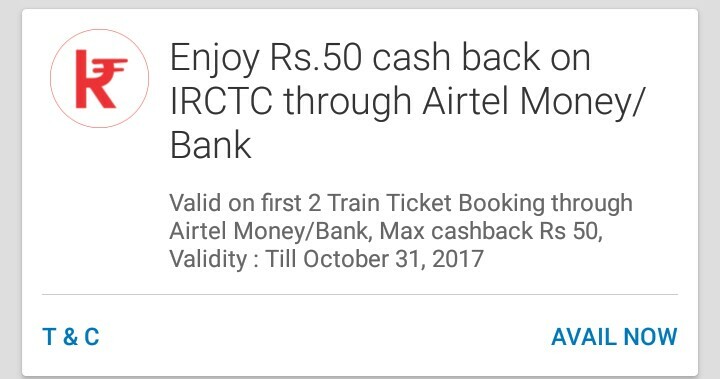 The both app are giving a maximum discount of rs 50 on booking ticket above rs 500. So avail and try it with the given terms and condition below to save some on your travels. 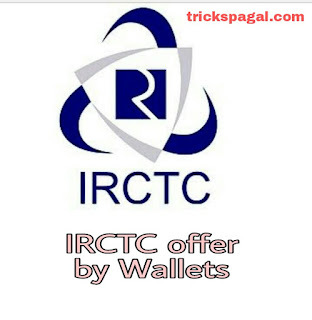 Offer valid only for PayZapp registered users.Visit the IRCTC website www.irctc.co.in and select ticket booking option. Choose mVisa (“Scan & Pay”) option on the payment page and select “Make Payment -> QR code generated ->Scan & Pay with PayZapp. Choose your linked & Pay with PayZapp to complete the payment. 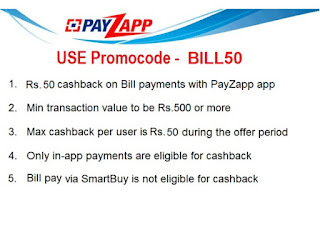 Flat Rs.50 cashback*, Scan QR code at IRCTC website & Pay with PayZapp. 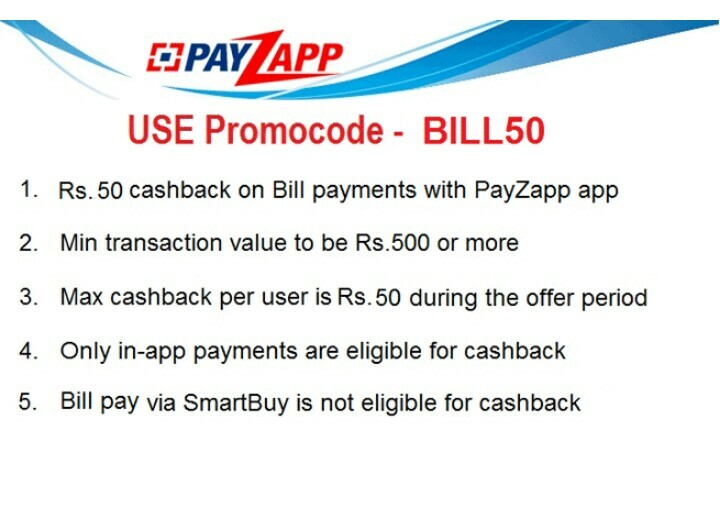 Minimum transaction to be Rs.500 or above.Maximum one cashback per user.In the event of any payment/cashback related issues, Please write to support@payzapp.in . Post successful transaction PNR will be generated and customers shall receive ₹ 100 cashback into their PayZapp wallet within 30 days of successful transactionOffer valid from 1st Oct to 31st Oct'17 . The offer is applicable only for Airtel Payments Bank customers: a) savings account customers, b) wallet customers (Airtel Money). 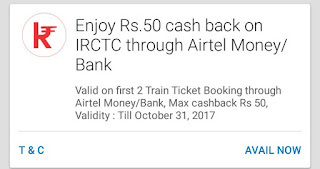 User can avail Rs.50 cash back on first 2 transactions (train tickets only) at IRCTC website & IRCTC app by paying through Airtel Money and Airtel Payments Bank. Offer can be availed from 1st October to 31st October 2017. Minimum Ticket size is rs.500/transaction in order to avail the offer. Cashback would be credited within 48 business hours in the user's Airtel Payments Bank account/wallet. In case of ticket cancellation, cashback amount will be deducted from user's Airtel Payments Bank account/wallet. Airtel Payments Bank does not warrant or guarantee availability of inventory on IRCTC website or IRCTC App. Any issue or customer dispute related to cash back with be entertained by Airtel Payments Bank only, please send your queries to wecare@airtelbank.com or call 400 (Airtel users) and 8800688006 (for non airtel users). I am totally in love with these IRCTC discounts on train fares.Now I along with my friend can go for a long weekend via train.I hope to have so much fun in this thrilling journey of train.